[2 In 1 Bundle] Two of the best kitchen tool in one bundle set, working together to support non-slipping kitchen food cutting works flexibly. [Milled Grooves Butcher Block] Double side, constructed of high quality natural bamboo 3-ply cross-laminated solid extremely. Arc shape groove catches juice of tomatoes and whatever else you want to cut; Beveled edge design for easier lift up. Less moisture absorbency, durable and sustainable. [Multipurpose Silicone Mat] A).Oven-safe up to 480 degrees F. Convenient non-stick baking mat. B). Amazing non-slipping support to the cutting board. 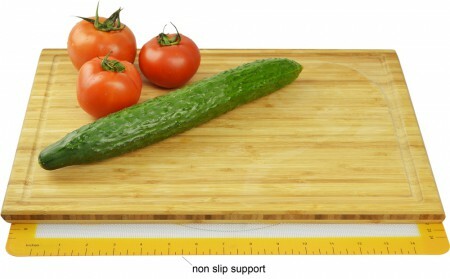 [Measurement] Cutting Board: 17 by 11 inch, 0.7 inch thickness. Baking Mat: 11.6 by 16.5 inch. FDA Approved. Bamboo Cutting Board is NOT dishwasher safe. Silicone Baking Mat is dishwasher safe. [Guarantee] 100% satisfaction guarantee, 100% worry-free guarantee. Make cutting fruits, vegetables and other prep works in your kitchen more stylish with the Surpahs Arc-Groove Cross-Laminated Bamboo Cutting Board. Unlike Maple and other traditional woods, bamboo is also less moisture absorbent, prolonging the life of your cutting boards with proper care. For best maintenance, it is always a good idea to apply for mineral oil or vegetable oil to the surface of a new bamboo cutting board once a day for a week, then do it once a month. NOTE: Bamboo cutting board is NOT dishwasher safe. If working on smooth counter top surface, you may use the bundled silicone baking mat to support amazing anti-slipping function. The flexible baking mat is made from durable, food-grade silicone that can be reused over and over. Fits half-sheet size pans, perfect for baking, kneading, rolling, bread making as well as for freezing meat balls, dumplings, fruits and vegetables. Microwave safe, dishwasher safe. Easy clean, simply wash the mat by hand with soap and water and allow to air dry, or place in the dishwasher.